I wanted to make Chow Mein, but noticed all Chow Mein I’ve eaten at restaurants or at fast food restaurants are prepared with a similar soy sauce/ sesame oil seasoning. I wanted to twist it up just a bit and do something different. I thought about it for awhile and for some reason Tomato Beef came across my mind. 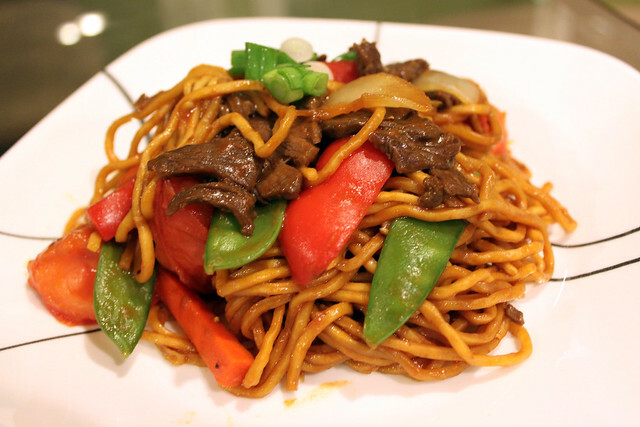 Tomato Beef Chow Mein – that sounded quite interesting to me and something I would want to eat. I don’t think I’ve ever eaten Tomato Beef before. I’ve probably seen it served at Chinese Restaurants and seen other people eat it, but I don’t think I’ve personally eaten it myself. I said what the heck I’ll just try it since it sounded good. 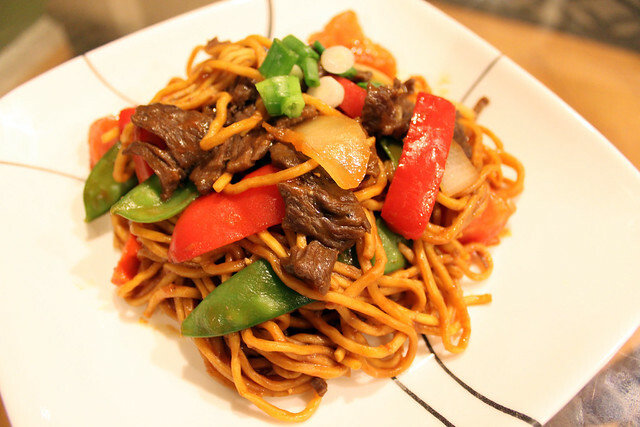 I started googling Tomato Beef Chow Mein and stumbled across Food Gal’s Blog. She made some scrumptious looking Tomato Beef Chow Mein. I followed most of her steps, but for my version, I used a few different vegetables and I used ketchup! It turned out pretty savory and tasted like a Chinese version of Spaghetti. After making this dish, I realized that marinating the meat in baking soda and cornstarch gives the meat the same kind of texture you get when you eat it at Chinese Restaurants. From now on, anytime I want to make Chinese food at home, I will make sure I mix corn starch and baking soda in my meat marinade prior to cooking. Slice beef tenderloin and add to large mixing bowl. Mix dark soy sauce, Maggi Seasoning, sesame oil, baking soda, and cornstarch and combine with beef. Allow to marinate in refrigerator for at least 30 minutes. Follow cooking instructions on Chow Mein noodle package. Put noodles in a large bowl, and mix in 2 tablespoons sesame oil, and 2 tablespoons dark soy sauce until noodles are evenly coated. Heat wok on Medium High heat. Add a little oil and stir fry beef until cooked and set aside. 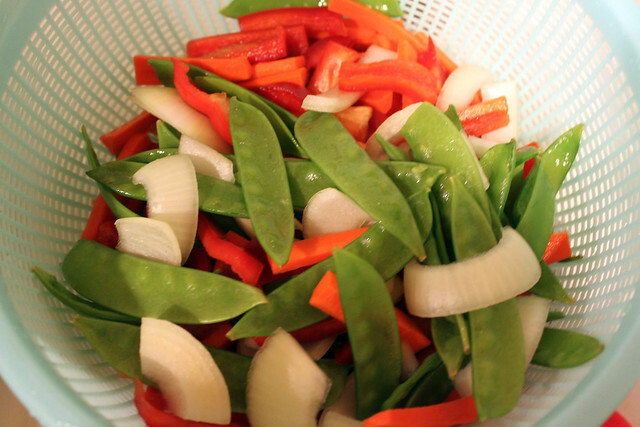 Stir fry snow peas, red bell pepper, carrots, and onions until cooked. 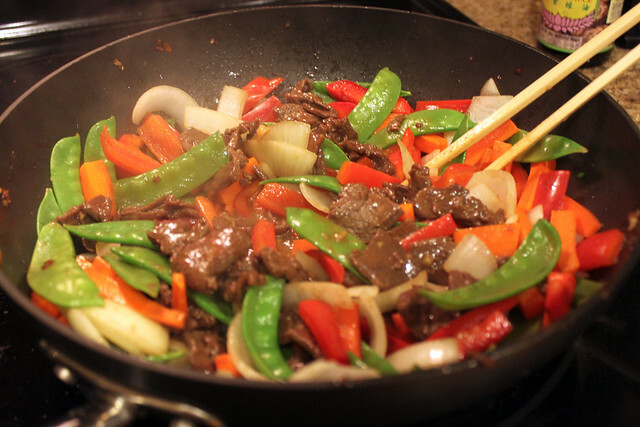 Add beef back into wok and stir fry beef with vegetables for another 1 minute. Mix in tomato chunks and ketchup and continue stir frying for another 1-2 minutes. Set aside. 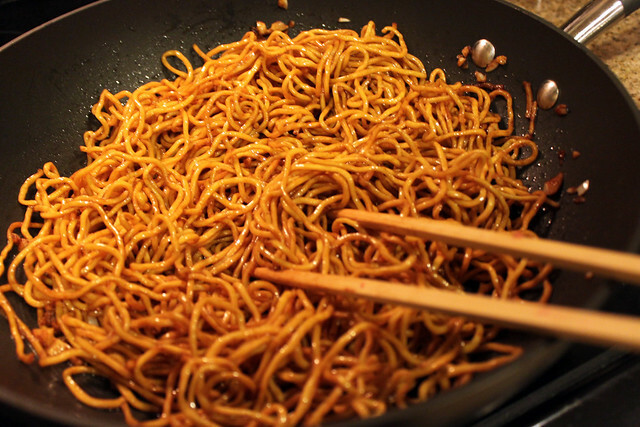 Add some oil to wok and stir fry noodles frequently until noodles browned a bit. Add the beef and vegetables and stir into noodles until evenly distributed. Add scallions and mix. Serve immediately.